In the town square, news is shared, stories swapped, old friends reunited, and new friendships and alliances forged. ​We hope this sense of community permeates not only our taproom, but also our brand and business ethic as well. “We’ll start out small, keep it simple,” Dave said. But I could already see that would be a fleeting phase. After listening to his battle buddies’ stories of home brew glory and mayhem, the microbiologist inside my husband was yearning to be set free. I could see the visions of the brew lab that danced in his head. But he did promise to brew a stout right out of the gate and, if I held on tight for the ride, it would be a great hobby to connect over. Navigating life as a military spouse and the perils of raising five kids necessitates following a lark or two. 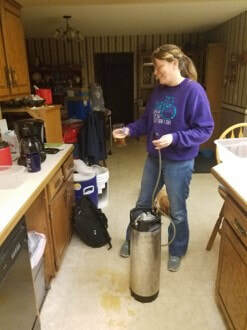 So, after a few purchases on Craig’s List and a trip to the home brew store, we were brewing our first extract kit on the kitchen stove. We brewed a brown ale, Irish stout, and Hefeweizen within the first month. Soon we were steadily brewing every other weekend, often two batches each brew day. We quickly moved from extract, to partial mash, to all grain; from following kit directions to the letter, to “amending” the recipes here and there. And, I must admit, it wasn’t long either until I began to muscle Dave out of his job as brewer and demote him to chief bottle washer and keg hauler. As we began to expand our knowledge of beer styles, I delved into the history behind the brews, their origins and the processes that developed with them. I started expanding my knowledge of malts and developing my own grain bills and recipes. Dave had always approached brewing like a scientist and had insisted on maintaining invaluable “lab reports” from the start. From our notes, I was able to recreate recipes, tweaking this malt addition or swapping out an aroma hop, or trying out an entirely different yeast, creating new recipes or fine tuning a favorite. Plain and simple, I feel in love with the story of beer. ​Hobby or obsession, we were both clearly hooked. But as the keg supply grew, family and friends didn’t seem to mind taste testing our endeavors and, as our adult kids quipped, as mid-life crises go, this one was bearable. When Dave’s retirement date finally arrived after 30 years with the U.S. Army, our thoughts turned to what we wanted to do now that we were all grown up. We had always envisioned building something together after retirement, perhaps running a small restaurant or pub. Quickly, that long-time dream fused with our new passion for home brewing. We would open our own microbrewery and taproom. With very few craft microbreweries in the northern suburbs where we lived, our neighborhood was the perfect fit. We would bring our passion for craft beer to the under-served northern suburbs. Hence the vision for Torg Brewery was born. With a focus on creating that perfect balance between malt and hops to craft a truly friendly, quaffable beer, it is TORG BREWERY’s pleasure to serve our patrons the rich complexity and marvelous flavors that water, grain, hops, and yeast combine to create. TORG BREWERY is committed to sharing our passion for quality beers and brewing traditions, supporting our local community, and bolstering the craft brewing industry. We are truly blessed to be in the business of crafting fine beer for great people and sharing some moments of cheer. We are incredibly lucky and humbled that our customers enter our taproom to share their stories with us. Just as we strive to create a perfectly balanced brew, we strive for balance in sharing our passion for beer culture with responsible enjoyment, the needs of the company with those of our staff and the community, and the use of natural resources with environmental stewardship. We are on a quest to foster fun, friendship, trust, and support among our taproom guest, brewery staff, local community, and the craft brewing industry. Dedication to a cause has served us well as we have faced the challenges in our journey thus far. Now we bring that same level of dedication to our brewhouse, our taproom, and our expanding Torg Brewery clan. ​GOOD BEER, GOOD FRIENDS, AND GOOD CHEER!